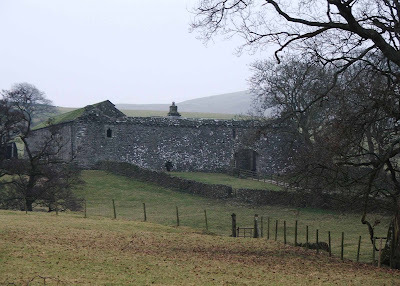 Situated just off the A683 North of Barbon and Middleton, the hall with its impressive surviving curtain wall, is an imposing site even today. The Hall was the abode of the Middleton family from the reign of Edward III right through to 1644, and consists of a central hall block, the hall with transverse wings at either end, and a massive wall, forming an inner and outer courtyard. 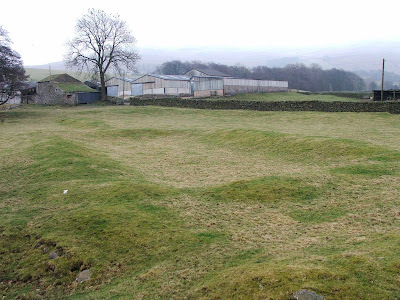 At the end of the driveway down to the main road, the earthwork remains of fish ponds can still be seen. Although on private land, good views of the hall can be had from the roadside. Thank you for posting about Middleton Hall on your blog. My ancestors lived there centuries ago. Unfortunately thre is little information about Middleton Hall or Belsay Castle in Northumberland on the internet so every piece I find is interesting. Thanks. Mathew, thank you for your photos of the medieval homes and castles of the North. Many of them are ancestral connections that I'll never be able to visit. You've made it possible to at least see them. Re Jim's comment. My mother's family whose name was Bownass lived there for several generations. Jim, are you a Bownass? I've just seen Anonymous's comment. My mother is 93 and her maiden name was Bownass. Her grandfather was Martin Bownass who lived at Middleton Hall before becoming a commodity broker in Manchester in the 1870's. Her local relations were called Batty and Blades and she speaks of various properties being in the family - Borwens, Beckside and Paradise at Garsdale. Are we related? Re David Owen's post A Martin Bownass appears on the 1841 census for Middleton age 17 would this be the same Martin. My Gt Gt Grandma was Mary Bownass and she was living at Middleton Hall with her father's (Richard Bownass) brother and sister in 1851. She was born, and normally lived in, another of the family's houses, Hawkin Hall. My grandfather farmed Middleton Hall until 1946 when he left to go to a farm near Sedbergh. His name was Todd, but trying to figure out when he would have first lived there. Any info appreciated.